According to the United Nations, 52% of the world’s population still has no access to the internet. This is according to the organization’s new Global Broadband Progress report. The report shows that global broadband continues to show healthy growth, but there are some challenges that need to be addressed such as: 1) making Internet access more affordable in developing countries; 2) slowing growth in mobile subscriptions; and 3) rates, roll-outs and financing needs of new deployments and network upgrades. More importantly, there is a growing digital inequality between developed and developing countries, as well as between the rich and the poor within countries. 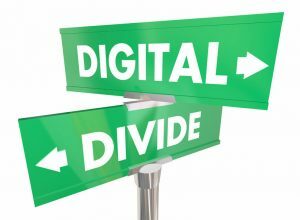 The digital divide, according to the U.N. report, is becoming a chasm that is highlighting the inequality in global connectivity between starters, adopters and front-runner countries. One of the indicators in this growing divide is average internet speed that is available in each country. The average global internet speed is 7.2 megabits per second. South Korea has the fastest average internet speed at 28.6 Mbps., while Nigeria has one of the slowest speeds with 1.5 Mbps. The differences between nations with a mature hi-tech infrastructure and developing nations were also deepened because wider use of technology could help other social goals, said the U.N. Greater use of information and communication technologies could accelerate a nation’s progress. While technology has been playing a part in helping many nations progress, there are still significant regional differences in accessing internet. Regional differences show Europe with 79.6% of its citizens able to access the internet while the Americas report internet access at 65.9% for its populations. By contrast, only 21.8% of people in Africa could access the internet. “Large gaps in connectivity persist, mainly due to the lack of infrastructure, affordability, lack of skills or lack of relevant local content,” said the report.